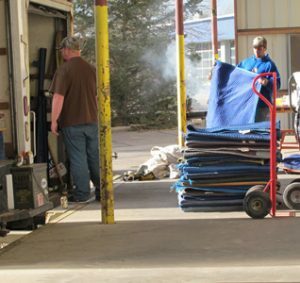 Billy Goat Moving & Storage in Fort Collins can move your business so that you can keep your business moving. Your office furniture, files, computers, and high-tech equipment will be handled with the utmost care and efficiency. We will expedite your move so your new office can begin working practically before the old one closes. Our job is to ensure that your business continues to operate as smoothly during transition as it did before the idea or need to move arose. Successfully moving a commercial enterprise is a multi-faceted operation that calls for a highly organized and experienced relocation company. It requires recognizing the needs of the customer, planning to serve those needs economically and satisfactorily, communicating the plan to the customer so we can coordinate our efforts and activities, and providing the necessary men and equipment to handle the job according to the predetermined timetable. Through our experience in moving laboratories, hospital departments, banks, libraries, computer companies, law offices, multi-story office buildings, and other businesses, Billy Goat Moving & Storage has formulated an organization of methods, equipment, and services that fulfills every requirement. Contact us today to receive your commercial moving quote!